After four days, DTG Bangladesh, the leading trade fair for machinery for the textiles and clothing industries, ended successfully on 11 February. The exhibition took place at the Bangabandhu International Conference Center in Dhaka, and hosted approximately 1100 exhibitors from 36 countries. Leading textile machinery manufacturer Karl Mayer was amongst the exhibiting companies at the event and was present on the stand of its regional agent Pacific Associates Ltd. The German manufacturer says it is very satisfied with its participation at the trade fair. 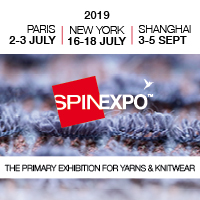 “We were able to present us and our products, and could make a lot of new contacts, “said Mark Smith, Sales Manager of Karl Mayer’s Warp Knitting Business Unit. In the course of the numerous discussions during the exhibition Mark Smith noticed the trend towards reorientation to in-house production. According to Karl Mayer, many manufacturers who have traditionally imported fabrics for making garments, are now considering setting up their own in-house textile production. Warp knitting, and therefore Karl Mayer plays a significant role in their considerations, the company says. Experts at Karl Mayer’s Warp Preparation Business Unit also had interesting and fruitful discussions during the event, mainly with customers who are already operating Karl Mayer machines.